My parents were in Edinburgh visiting, so we decided to take a stroll in Newhaven on what turned out to be a sunny but breezy day, and try out The Fishmarket. Situated on Newhaven Harbour, The Fishmarket has only been open a few months. Offering both take away and restaurant dining, I would recommend booking in advance, as this place got busy. We were seated by the window, with a lovely view of the harbour and the Forth, and had a look at the menu. I would imagine most people come here for fish and chips, but there are some other options. I chose the squid and a small portion of chips. My parents both opted for fish and chips, one choosing the medium size and the other the large (you can go as big as ‘whale’ sized). My mum couldn’t resist ordering some mushy peas on the side and I ordered a garlic mayonnaise. My squid arrived and there was plenty of it, although possibly not enough to justify the price. It was accompanied by a Vietnamese dipping sauce. The squid was not rubbery and the coating was light. The dipping sauce had a sharp edge to it that I loved. This worked really well together. The chips were of a decent standard. I couldn’t really tell the difference in size between my parents’ portions of fish and chips, which was a little odd. They really enjoyed the fish though and agreed that the chips were nice. The mushy peas got a thumbs up. We were too full for dessert but there were some good things on offer such as lemon posset and chocolate pots. The Fishmarket was a nice lunch outing, in a lovely setting. Would I eat here again? Probably. £36 for 1 large haddock and chips, 1 medium haddock and chips, squid, small chips, mushy peas and a garlic mayo. After giving blood, we wanted to go somewhere not too far to get a quick hit of food. We decided to try Wings to top up on some chickeny goodness. Hidden down one of the closes in the Royal Mile, Wings has more space than you would imagine. Upon arrival it feels as if you’re entering an underground secret club of eaters. The place was busy and not surprisingly popular with students. Each table hds a theme and the walls were covered with quirky drawings and decorations. There was plenty your eye is drawn to. The menus didn’t indicate the price for food but it did for drinks, which is a bit odd but we could see on the blackboard that each bowl of 6 wings was £4.20. A small range of other sides are available such as chips but we decided to go for two bowls of chicken each. The menu also indicates heat levels which was useful. In the end I went for ‘ooft ‘ and ‘jamaican me crazy’ and my friend chose ‘Mardi gras madness’ and ‘push it’. Upon arrival of the bowls, we were told that the two buckets in the table are for rubbish, one for the bones and one for everything else. We got tucked in. This was going to be a messy affair. Firstly I ate my ooft chicken. This meant my wings were covered with hot garlic sriracha sauce and a chicken rub. This almost had a sweet and sour flavour combined with a bit of heat. These were good. However, I preferred my second bowl, Jamaican me crazy, which was a BBQ jerk sauce. This was just right, with a mild warmth permeating through the barbecue sauce. The chicken was succulent in both dishes. On the other side of the table, the mardi gras madness sounded like it had a similar flavour to my ooft wings. They were covered in a Louisiana hot sauce. She was definitely left with a very tingly mouth. She then moved onto the push it wings, which had a salt and pepper coating. She enjoyed these too. This was a fun experience and with plenty of different toppings, you can get a completely different flavour sensation each time you visit. Cost – £20 for 4 bowls of wings and 2 soft drinks. I was very aware of Ed’s Easy Diner in Soho, London as I’d always wanted to try there but never had. Luckily for me, I was asked to try out the one at Fort Kinnaird. I’ll admit, I haven’t come out to the Fort that often as I live in the centre of the city. So since I last visited there is now a cinema, a Primark and a whole host of other new places. Ed’s sits centrally on the site so if you get a window seat as I did, you can sit and watch the world go by. Ed’s is an American style diner, with booths, chequered flooring and a 50s Americana soundtrack (more about that in a moment). I was shown to a window booth and I got stuck into looking at the menu. Ed’s have launched a new additional menu with a Tabasco theme. I wasn’t brave enough to go whole hog on this but got the service bottles on the table to try later. The diner serves mainly burgers and hot dogs and you can order sides on top or to save a few pennies, order an Ed’s plate which consists of a burger, fries, onion rings and coleslaw, which is exactly what I did. I chose the Cheese or Cheese burger, with American cheese. You can upgrade your fries in a multitude of ways but I opted for the standard version. I also ordered a large Diet Coke which was good value as it’s refillable. There are shakes, including boozy and ‘skinny’ versions, on offer but I decided to try to leave room for dessert instead. Whilst I was waiting for the food to arrive (which really wasn’t too long at all), I spotted a mini jukebox on the table. For 20p you can pick a song from the likes of Elvis Presley, Buddy Holly, Beach Boys, Bill Haley etc. Also the money goes to Action Against Hunger. What a fun idea! I also noticed a squeezy ketchup bottle rather than a glass one – bonus points! So, the burger arrived and looked great. I was a little apprehensive about choosing the plate option as I thought it might be an over facing size but it wasn’t. The burger was meaty and generous. The salad on the burger seemed fresh and of good quality. The fries were somewhere between a string fry and a chip, so would probably please both camps. The onion rings were large and the batter was not too heavy. The coleslaw was quite creamy but served in a relatively small size which seemed just right. I tried some of the Tabasco chipotle version and was pleasantly surprised at how nice it was. I left a few of the fries in order to try to squeeze in a dessert. I toyed with the idea of one of the waffle s’mores but ended up going for apple pie with an additional scoop of ice cream. The pie slice was very generous and deep. It did include sultanas, which I loved but wasn’t on the description of the pie on the menu. There was a nice cinnamon tone through the pie and the pastry wasn’t dry. The ice cream tasted a bit like a Mr Whippy but in scoop form rather than soft serve. Overall, Ed’s Easy Diner was a pleasant experience. The staff were friendly and helpful and the atmosphere was fun. The food left me happily full. Would I eat here again? Very much so. Cost – complimentary but the true cost of meal approximately £17. Please note that whilst this was complimentary, views expressed are my own. Thanks to Vanessa from Hummingbird Communications for arranging this visit. I was invited by Craig and Felicity at Reekie’s Smokehouse to see what they were all about. I had no hesitation saying yes as this place had been on my ‘must try’ list for a while. 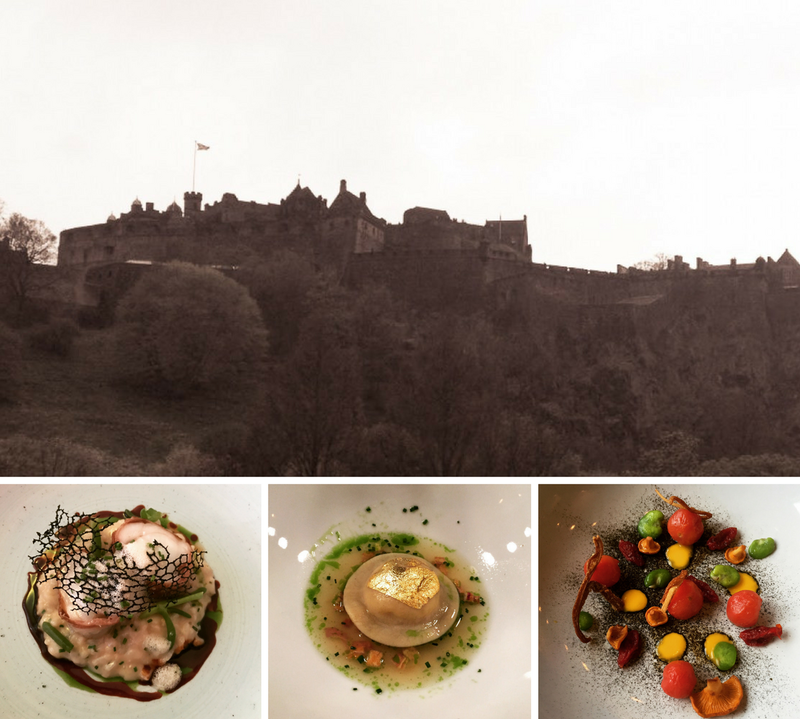 Situated on Holyrood Road, a stone’s throw from the Royal Mile, this place is easy to get to from the centre and has been open for about 18 months. Craig and Felicity were welcoming but you could see that wasn’t just for my benefit. It was clear they had an enthusiasm both with regulars and tourist alike. Firstly, I should say they offer more than just meat (but meat is the star and smoked on the premises). Reekie’s also offers milkshakes; booze; boozy milkshakes! Felicity also makes cakes (including many gluten free options – which also can be catered for across the menu). As I love most food, they kindly provided me with mini portions of a variety of options – therefore please note that the photos do not show full portions. You pay at the counter and get a buzzer which will let you know when the food is ready for you to collect. The venue itself is unassuming and on sunny days can have seating outside. Anyway, I digress. Let’s get to the good stuff – the food. The menu has options of meat tubs and sides in multiple combos. Sandwiches are also available. There is one veggie sandwich option of veggie haggis, so non-meat eaters are not left out entirely. I first tucked into the BBQ beans which were phenomenal. This ended up being my favourite of the lot. There was a sweetness to the barbecue sauce and the little pieces of meat scattered through made it a heftier option than just beans on their own. The burnt ends of beef brisket were so juicy and had a nice warmth emanating from the sauce. I was worried that the pulled pork might be dry but it was not at all. You can still add a variety of sauces (all made by the Smokehouse themselves and hopefully able to buy to use at home soon). I tried both the whiskey jerk sauce and the Irn Bru BBQ sauce. Both were great although I would recommend the jerk if you like a bit of heat as this hits a sweet spot that made it quite moreish. The slices of beef brisket were succulent and easy to eat without much use of a knife. The non-meat sides I tried includes a coleslaw which crunchy and refreshing. It wasn’t too creamy which can be the downfall of supermarket bought stuff. Pickled cucumber surprisingly works for my usual cucumber hating palate. The rosemary chips were full of flavour but a word of advice, share a bag between two if you are having a few meat tubs as the portion is very generous. Reekie’s encourage no waste. When I asked if I could take my leftovers away I was pleasantly surprised to see they were already set up for this. Lids for tubs are already provided at the side. It is also a self-clear place, tidying up after yourself but with clear recycling bins this is a doddle. Reekie’s slowly started to fill up as I had sat eating. The crowd was mixed, with workers, tourists and families all sitting side by side chowing down on some BBQ goodness. Before I left, I got two pieces of cake to take away to try later (I was too stuffed to eat them there and then!). I chose a malteaser blondie and a gluten free coconut chocolate brownie. Both were a gooey triumph! I really should have come to Reekie’s sooner. This stuff is delicious. Now get me some BBQ beans and a boozy milkshake. Please note that whilst this was complimentary, views expressed are my own. Thanks to Craig and Felicity. I have been itching to get to this place since it first opened but as Bruntsfield isn’t along my usual path anywhere, we had to make a planned visit. Meltmongers is not strictly a restaurant, but you could technically have a main and dessert which is why I am reviewing it. I have to say, it is lovely to see a small business opened on a Sunday, so we took full advantage and got stuck in. Whilst Meltmongers is a small venue, there is enough seating for around 20 at full capacity. It was getting close to being full whilst we were there and plenty of other customers were popping in for takeaways. The menu is relatively straight forward; there are cheese related toasties, burgers, sweet toasties and some sides. I decided to go with the Big Cheese and my friend went for the Melt Madame. We placed the order at the till and then grabbed a seat and waited for it to be brought over. A few minutes later, the toasties arrived and looked glorious. I couldn’t wait to get tucked in and I was right to. My toastie – the big cheese – was cheddar, American cheese, Gruyere with a sweet tomato and chilli chutney. The cheese was oozy and full of flavour (and not overfilled to avoid it hardening into big lumps). The chutney was a pure delight. The sweetness helped lighten the weight of the cheese and I thought was a much better alternative to ketchup. On the other side of the table, the Melt Madame was also being enjoyed. Whilst a little less cheesy than mine, the emmenthal still worked well with the ham and egg. The scattering of cheese on top of the toasties was a nice touch to give them one last extra cheese hit. The sweet toasties also sounding amazing (I really must try the one with Nutella and marshmallows) but there was no way we could fit one in at this visit. A joyous little place, where simple things are done well. Would I eat here again? Ooooooooh yesssss! Bread Meats Bread is yet another in a long line of burger joints opening up in Scotland’s capital. This burger place has already been doing a good trade over in Glasgow. I had seen plenty of photos and positive things on social media but would it live up to the hype? You cannot reserve a table in advance but we got a table easily. However, within 20 mins the place was pretty much full, so be prepared to wait but they have crammed in as many tables as possible and the service is quick so you shouldn’t be waiting too long. The menu offers a good array of burgers along with some sandwiches and grilled cheese options. I went for my standard choice when trying a burger in a new restaurant; the cheeseburger. My dining companion for the evening opted for the Black ‘N’ Blue, which included blue cheese, crispy bacon, sautéed mushrooms and blue cheese mayo. We spotted that you can add extra patties to your burger but not knowing what to expect, we decided to hold off. I topped mine up with bacon chips and my friend went with standard chips that came with the skin on. We didn’t go for poutine but I have heard it is good here. Our drinks order arrived and whilst it was just a diet Coke and a Sprite, they were draft and not very well mixed at that, which was a bit of a shame. The food, however, came in quick time and we got stuck right in. The burger was beautifully juicy and the cheese was delicious (I like American cheese but it can be upgraded to Monterrey if preferred). The slow cooked onions were a sensation and the sweetest and tastiest I think I’ve ever had. The bacon chips were good but the portion was perhaps on the large side, at least for me. The spicy beef mayo and bacon on top of the chips was a nice change. I still would have preferred skinny fries but that is personal preference. On the other side of the table the blue cheese was not too subtle or over powering the burger. The bacon was nice and crispy and a smile was beaming across the table. Again the chips were good but she, like I, struggled to finish them. Overall Bread Meats Bread offers a good experience and I’m looking forward to trying other burgers on the menu. Would I go here again? Yes!